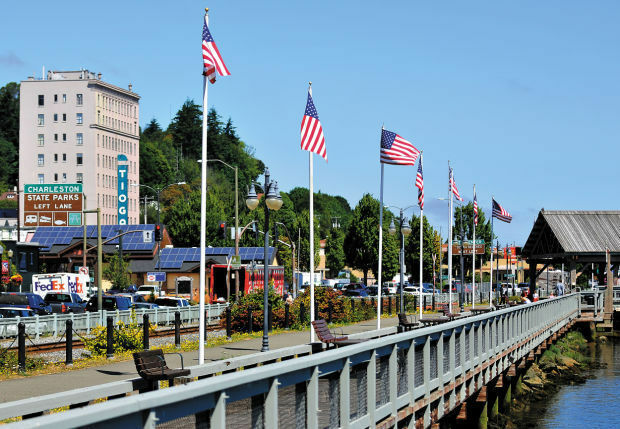 Vexillonnaires in Coos Bay, on the southern Oregon coast, have prompted the redesign of a prominent flag display along the city’s waterfront. 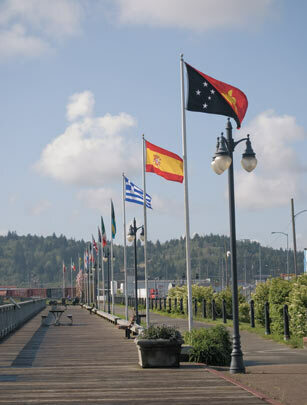 In 1991 residents wanting to “spruce up” Coos Bay convinced the city to fly flags representing the 34 countries that used it as a port of call. Flag poles along the boardwalk and Central Avenue flew these flags for 18 years, when in 2009 the city passed a resolution to fly only U.S. flags until troops returned from Iraq and Afghanistan. US flags fly along the Coos Bay Boardwalk. Photo by Lou Sennick, The World. International flags fly along the Coos Bay Boardwalk. Photo from Oregon Coast magazine. In 2012 the question of returning to the previous display was put before the city council, which voted against the measure. This year, feeling an end to the Iraq and Afghanistan wars was within sight, a city council subcommittee again proposed changing a return to international diversity, but adding flags of states, Indian tribes, and countries particularly significant to the region. 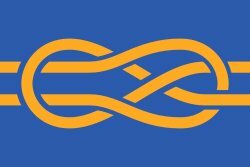 An anonymous donor would fund the new flags. Replacing the US flags was controversial, especially among veterans. The city council delayed voting on the proposal in order to ask the public for more input. Finally, on December 2 they approved the redesign of the display, with the compromise that US flags would continue to fly along Central Avenue. 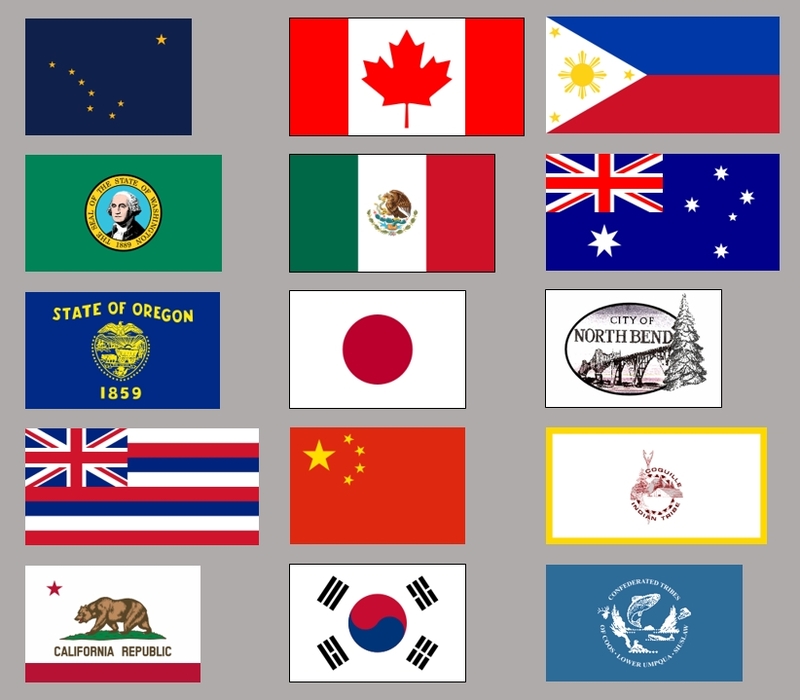 The new display will consist of US state flags (Alaska, Washington, Oregon, Hawaii, and California), country flags (Canada, Mexico, Japan, China, South Korea, Philippines, and Australia), and “locally significant entity” flags (City of Coos Bay; City of North Bend; the Coquille Indian Tribe; the Confederated Tribes of the Coos, Lower Umpqua, and Siuslaw Indians). In addition, a flag declaring the Port of Coos Bay to be the Tall Ship Port of Oregon will be flown. Flags to be included in Coos Bay’s boardwalk display. Missing: City of Coos Bay and Tall Ship Port of Oregon flags. Images from Wikimedia Commons and FOTW. Ted Kaye’s 15 minutes of fame— in small portions…. Your loquacious Vexilloid Tabloid editor has recently been interviewed on Slate (Mike Pesca’s podcast “The Gist”); 99% Invisible (the “tiny radio show about design” by Roman Mars); and National Public Radio’s All Things Considered (“What does its chosen banner say about ISIS”). In the interviews he discussed the flags of the UK (after Scotland…), New Zealand, Ukraine (and breakaway territories), the Islamic State, and—most importantly—Portland! 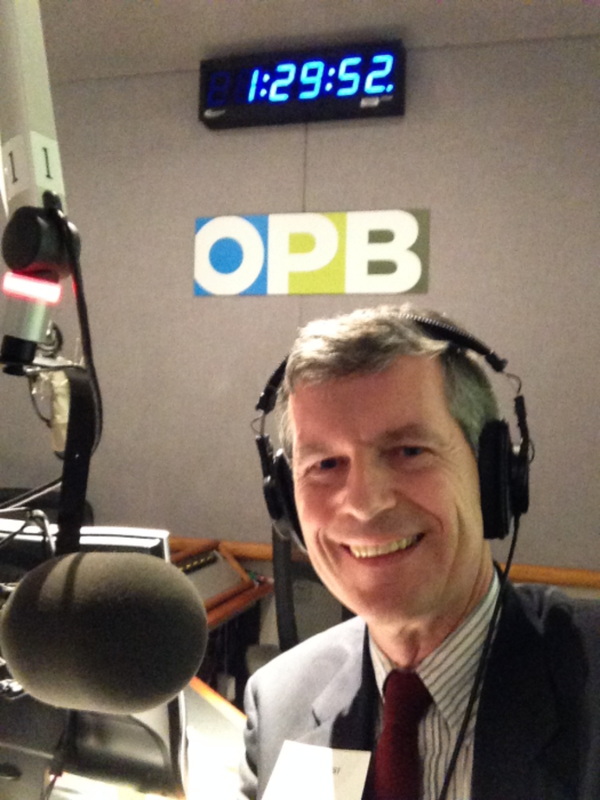 To record the 4-minute NPR/ATC segment, he visited the studios of Oregon Public Broadcasting, and spoke from there to Tess Vigeland, former OPB reporter and now a guest host of All Things Considered at NPR West in Los Angeles. 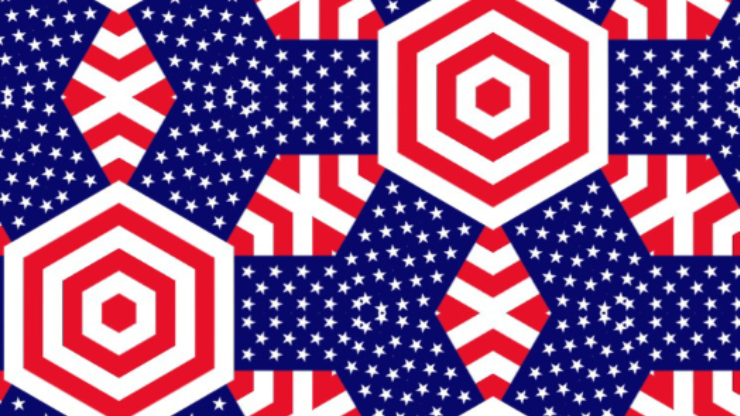 David Koski is experimenting with repeating designs derived from flag images, using various transformative algorithms. 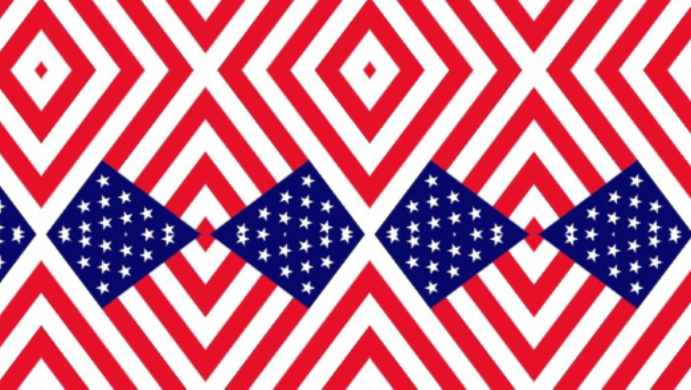 Every one is based on a component of the full flag. 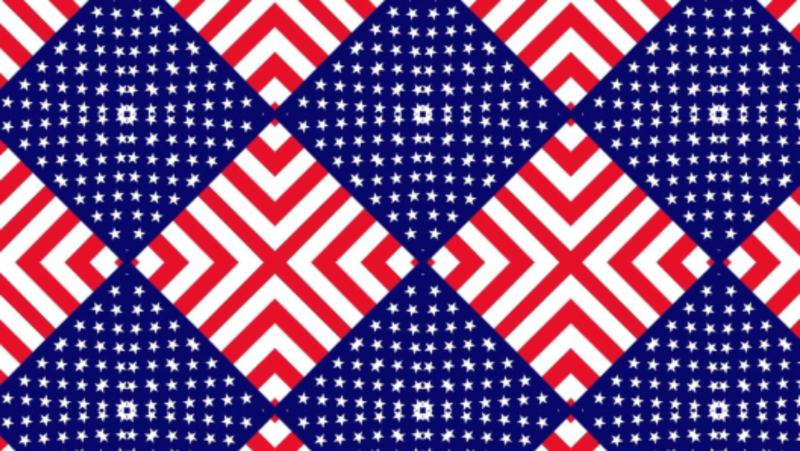 Here are examples based on the United States flag. 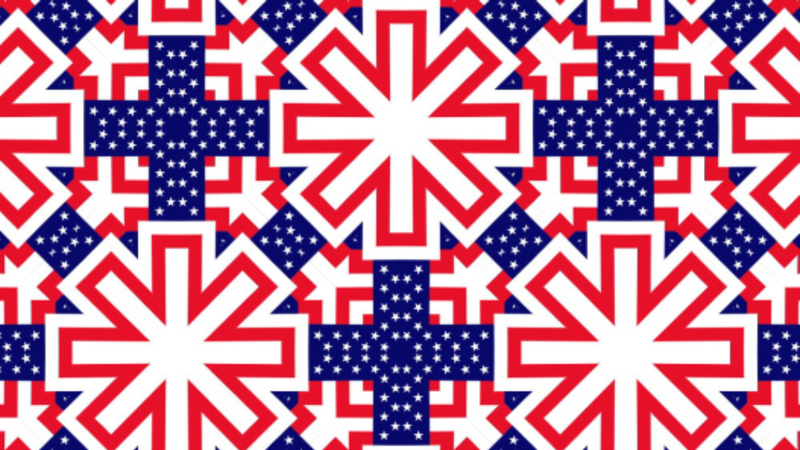 David has also developed versions based on the Union Jack and the flag of the city of Portland. He shared these designs at the November meeting. They might be used for wrapping paper or other similar decorative purposes. PFA members applauded his creativity and urged him to pursue marketing the concept. Wouldn’t it sell well in Chicago, for example? In San Francisco’s Hayes Valley neighborhood, Joe Theisen spruced up his building at 540 Laguna St. with 33 holes in the façade and first famously displayed the flags of all 2014 World Cup countries (plus Ireland). In September new flags went up. 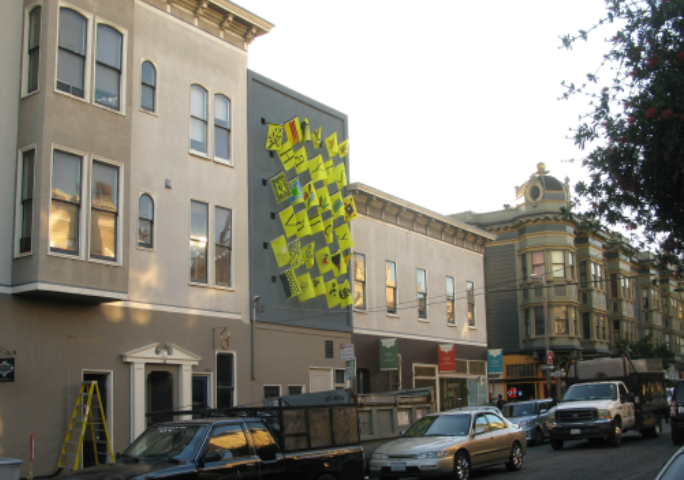 Now referred to as “the Flag Wall” (or, less popularly, “the House of Holes”), the building currently flies 10 flags that spell out “Hayes Valley” (two Ls share a flag) and 23 flags designed by artists affiliated with the nearby Hayes Valley Art Coalition. 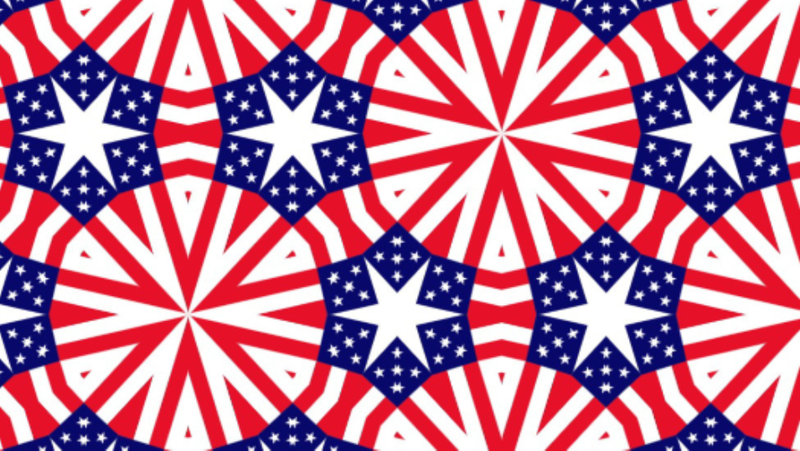 What is the Most Patriotic Color? …asked Time Magazine in its “Answers Issue”, Sept. 8–15, 2014. After downloading images of 196 national flag from Flagpedia.net, Time added up the number of pixels of each color, simplified them, and grouped them into categories of white, black, red, blue, green, and yellow using a simple algorithm. 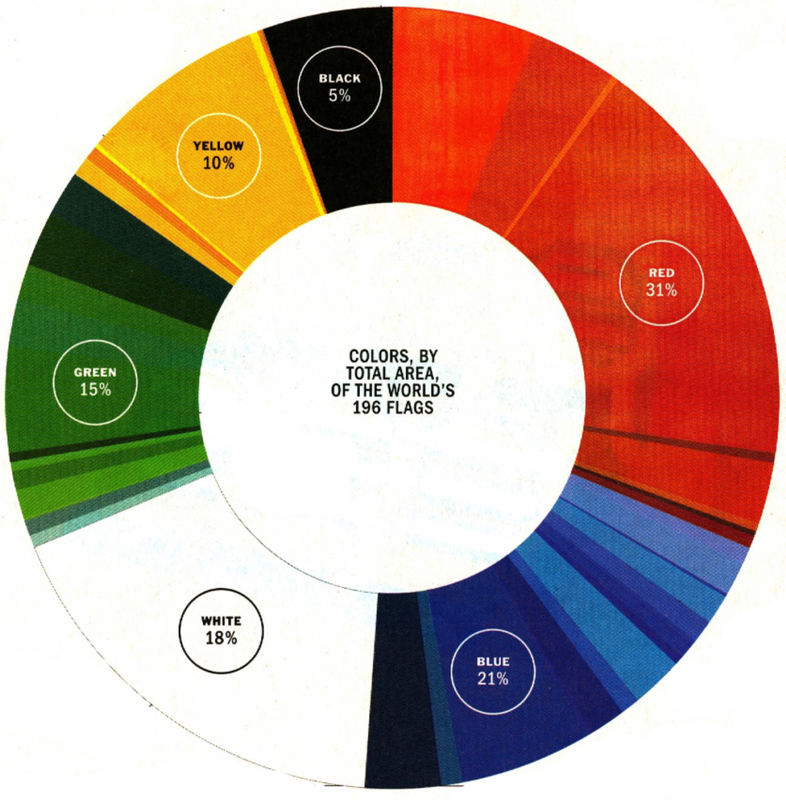 Time thus determined the frequency of colors by area in national flags. Although perhaps flawed in detail, overall it is a sound analysis. 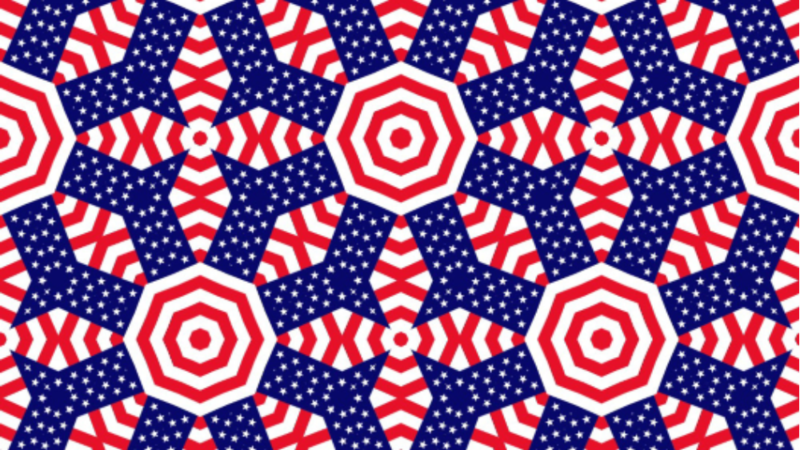 For an interactive browser, visit http://time.com/patriotic-flag-colors/. 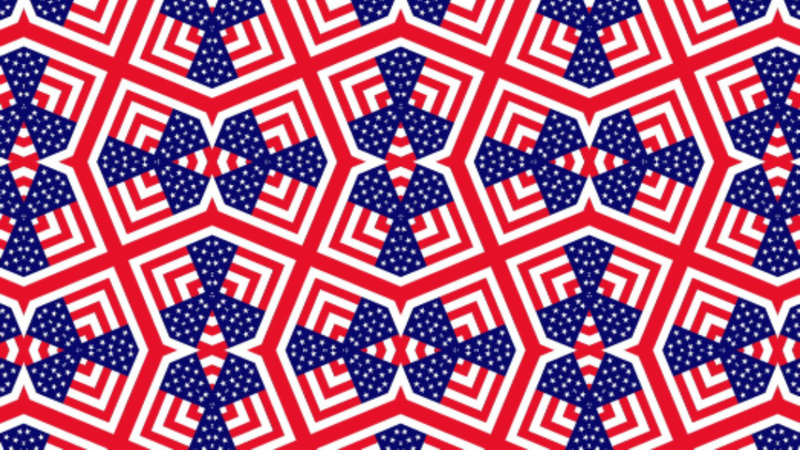 Author SDMPosted on December 5, 2014 October 15, 2015 Categories PostsTags National Flags, VexTab49Leave a comment on What is the Most Patriotic Color? In Sausalito, Hanson Gallery Fine Arts offers owner Scott Hanson’s American Flag with License Plate Slogans. 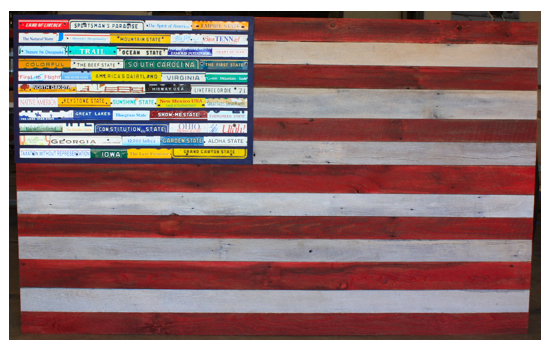 Made from real license plates and 100-year-old barn wood, and measuring 52” x 84”, it sells for $17,500. 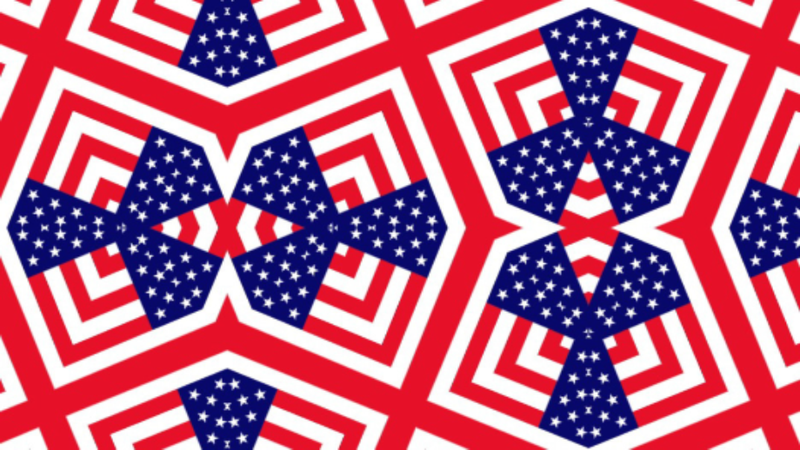 You’ll also find a “What’s that Flag?” quiz from David Ferriday, notes from the November PFA meeting hosted by Michael Orelove, and other items of vexillological interest.